The old house I inherited, has a patch of ground where False Bamboo or Japanese Knotweed has taken over. My mother used to call it Chinese Bamboo but it isn't bamboo. I thought if I simply cut it down it would die off. Well it is pretty luxuriant if the picture is any indication. You would think I have a very green thumb...but actually I have been trying to kill off the darn plant and it comes back more beautiful than before! I have been hacking the stems down like a native in the Amazon, except I don't have a machete and these plants are growing in Northern Ontario! I have been researching on what this plant is and how to contain it and am amazed to find that there are persons that love this plant even though it is very invasive and kills all other vegetation that attempts to grow underneath it. The International Union for Conservation of Nature classifies it on it's list of the 100 most dangerous invasive species in the world. 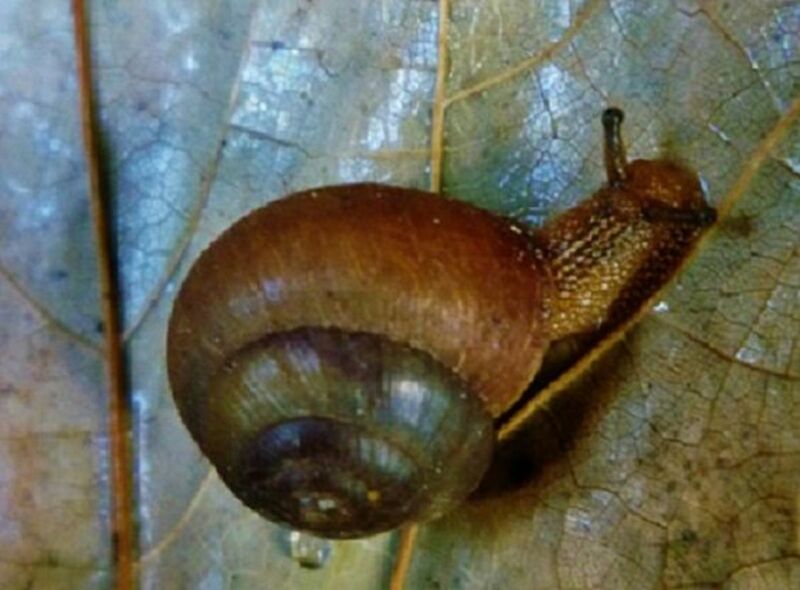 It originates from Japan where it isn't quite as invasive as in North America. In North America it has no native natural enemies to keep it in check. The plant limits diversity of vegetation where it grows by releasing chemicals that inhibit other plants growing in it's location. I can testify to that. Cut back that thicket and the ground is devoid of other plants; it is completely barren. 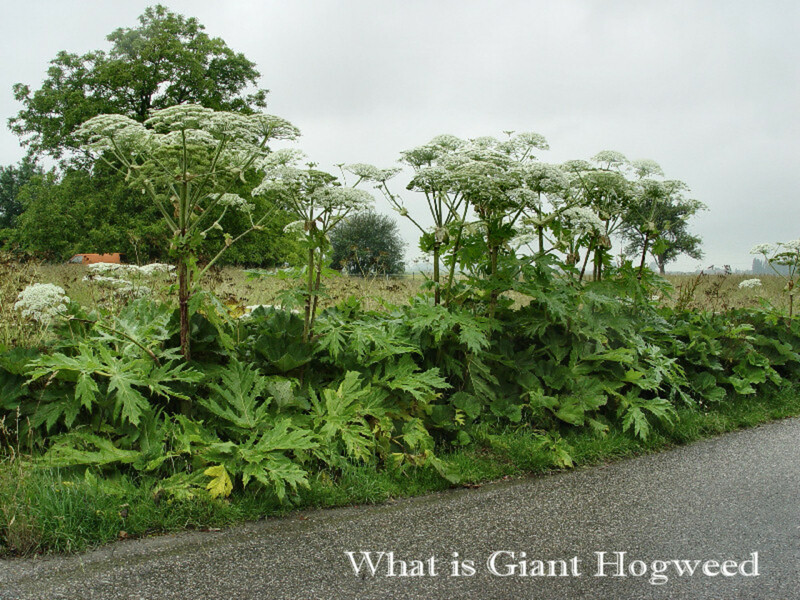 The plant grows very tall, over five feet and so dense you cannot walk through the patch. The stalks are semi-woody and hollow. The stems are easily cut with garden shears and there is no undergrowth to speak of, once cleared you are left with sharp hollow spikes and barren ground. Luckily, the area is contained at this point, but eradication seems to be quite the problem. Cutting it down seems to grow a particularly verdant new crop, but I noticed cutting does allow other species to gain a foothold back into their own territory, since once cut back other species will once again have sunlight to grow! The first year, I just cut down the plants and left them in a pile. Next year the new crop was just invigorated, as if I had done nothing. The second year I piled the cuttings and placed a tarpaulin on the green foliage and seem to have successfully rotted those stems and only a few shoots came up in the area that was under the tarp. This year (the third) I redid the cutting earlier than before (no flowers and placed the green shoots under a tarp once again to rot the stalks and meticulously went through the area to cut each plant. Cutting each and every stalk is simple since the plant is easily distinguished from it's surroundings. Hopefully next season I will have cleared another area for other new plants. Not entirely sure if I can eradicate this plant from the garden. 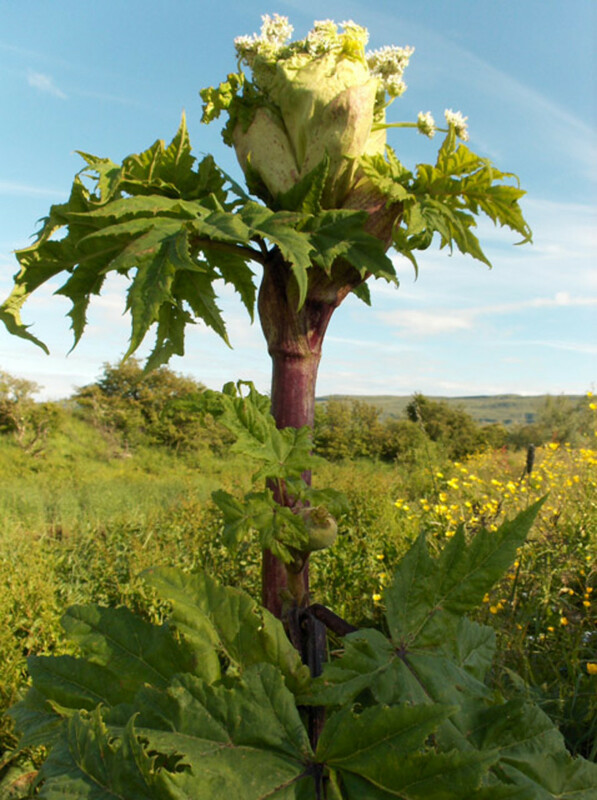 A word of caution for would be gardeners: research this plant, do not plant unless you know you can contain it! This is the area that site actually covered. No other plants under the canopy! Note the dried pile behind...the previous year's cuttings covered and dried...very little growth. Cutting down the False Bamboo was relatively easy. Nothing but a pair of garden shears and some effort. It took a morning of work and the new growth was a pile of greens. I left the cuttings where it grew to discourage it going rogue outside it's boundary. This plant cannot be moved anywhere as a cutting. 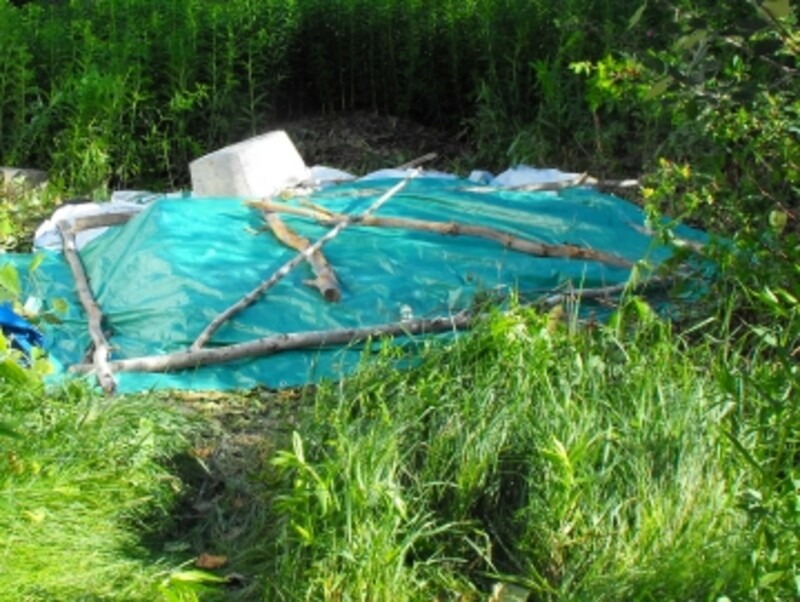 Destruction needs to happen on location and tarps are handy to cover cuttings causing them to die and rot. Unsightly, but totally necessary! 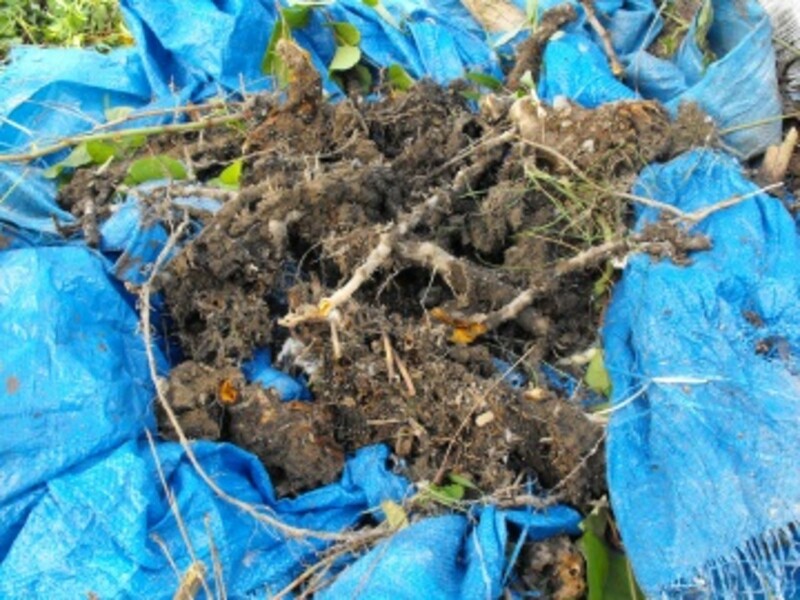 False Bamboo was piled under a tarp to rot and not allow it to regrow. Each crop has to be cut down and rotted on the site it grows on to avoid new areas of growth going rogue! After the False Bamboo is cut down it should be rotted on site of the growing area and not allowed to re establish itself. Providing a tarp that does not allow light through will accumulate heat and destroy the growth under it. Now we wait...will it grow back? Probably, but hopefully weaker by next summer! This will be repeated until I claim this area back from these tough and resilient plants. the False Bamboo has taken cutting in stride and is attempting a comeback. Though not as tall, and certainly not coming back in the area covered by the tarp, it has started new shoots from existing stalks and some frail new shoots from the roots. Seeing as the existing root stalk is allowing new growth that seems more robust and the good fortune of rain to soften the earth, I decide a more efficient way of eradication might be pulling the new stalks instead of cutting them. Fortunately, the rain has softened the soil and quite a bit of root comes up with the stalk. This area had a tarp cover over last year's cuttings. The tarp was removed this spring. 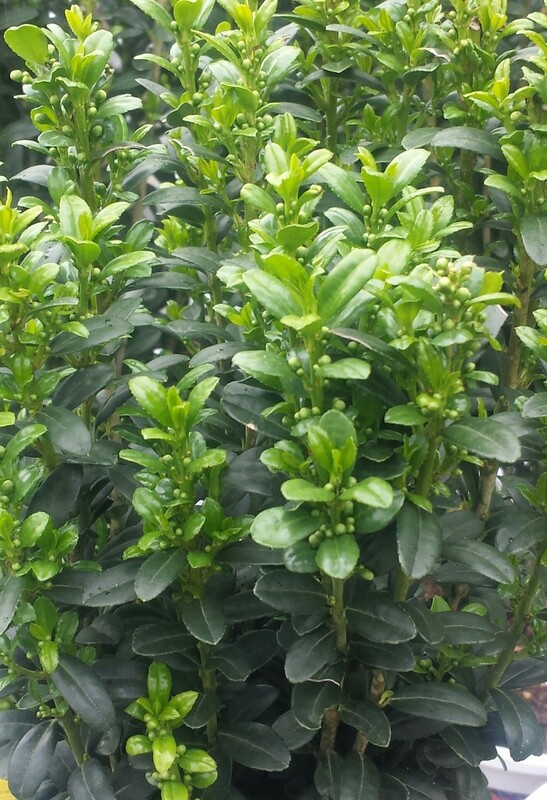 New growth has started and needs to be controlled but note some success in curtailing re-growth. The area that was tarp covered from the previous year was uncovered when this year's first growth was cut down. The good news was that the growth in that area was weaker than on the area just cut down and left uncovered. What was heartening was the fact other plants are starting to make inroads and reclaiming their own natural habitat. There is hope! According to the video below, it will take ten years of diligent work to eradicate it. Oh bother! In among the dried stalks were "wine" red shoots, about two inches tall making their debut on the fringes of the tarp. At this moment, there does not seem to be any life in the old uncovered pile of false bamboo that had been allowed to dry and rot under the tarp for a season, but it did have some shoots last season which I pulled. It is too early to know if I will remove the turquoise tarp from last year's crop of false bamboo that I kept covered to dry , rot and keep in the dark. I think I will watch the old pile for awhile and buy some more tarps for the fringe areas. So far the most effective treatment seems to be cutting the stalks and leaving them right where I cut them and covering them. Denying the plants light and not allowing the new growth of false bamboo an opportunity to strengthen the root system allows other plants to begin to re-establish themselves. This spring, I seem to have made some progress. 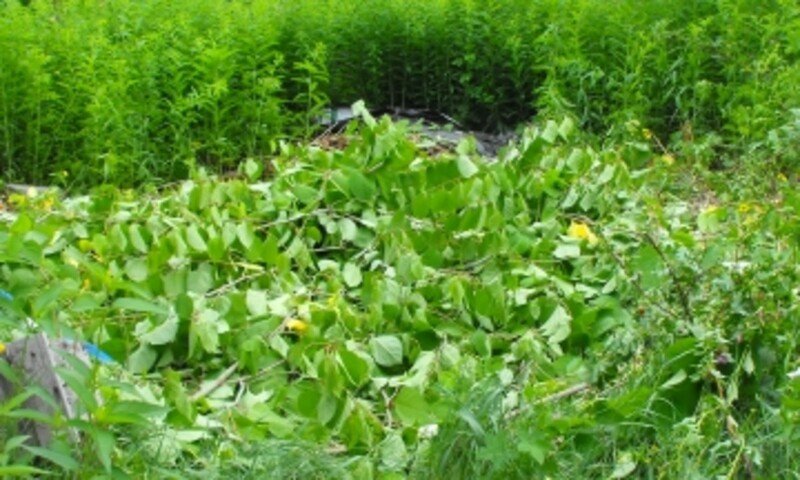 However, the battle has not been won and I need to be very vigilant for as long as it takes to eradicate this invasive plant...it is extremely hardy and resillient. Fortunately, the area can remain fallow for quite some time since this isn't normally a garden area. The tarps are unsightly, but necessary! Summer 2011.... The new growth around the fringes is still very lush with Japanese Knotweed. The battle continues! The good news is that other new vegetation is starting to reclaim some of the area back. 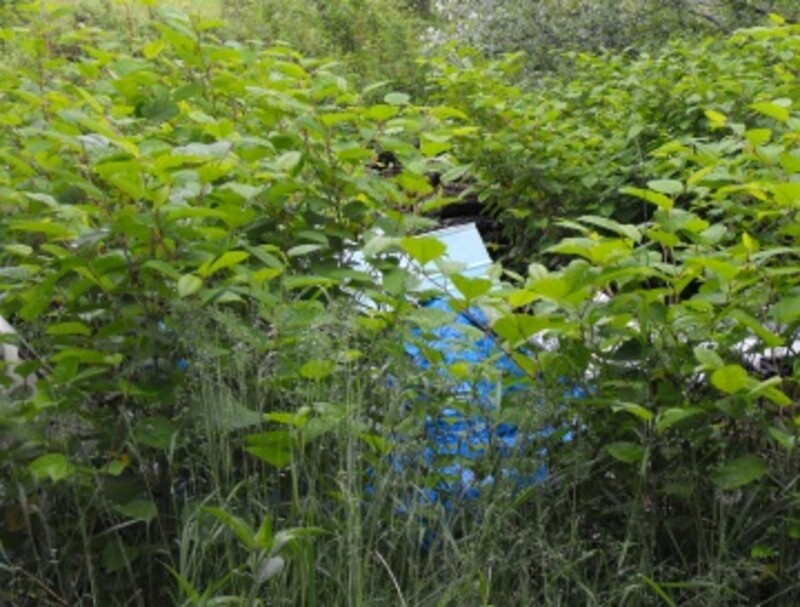 The tarp covered area from last year is fairly dormant with dead vegetation except for some anemic stalks of Japanese Knotweed snaking under the tarp towards the edges. The tarp has now been moved to cover another area widening the area reclaimed. September 2011...The battle isn't over...I have cut this year's crop on the fringes three times. The last growth was smaller but I have no illusions if I left the patch on it's own it would reclaim it's area in no time. I am becoming slowly aware that covering the area permanently with a waterproof and lightproof tarp for a number of years may be the only choice barring using insecticide which I am loathe to use. As you can see...this is a plant to avoid ever getting into your garden! 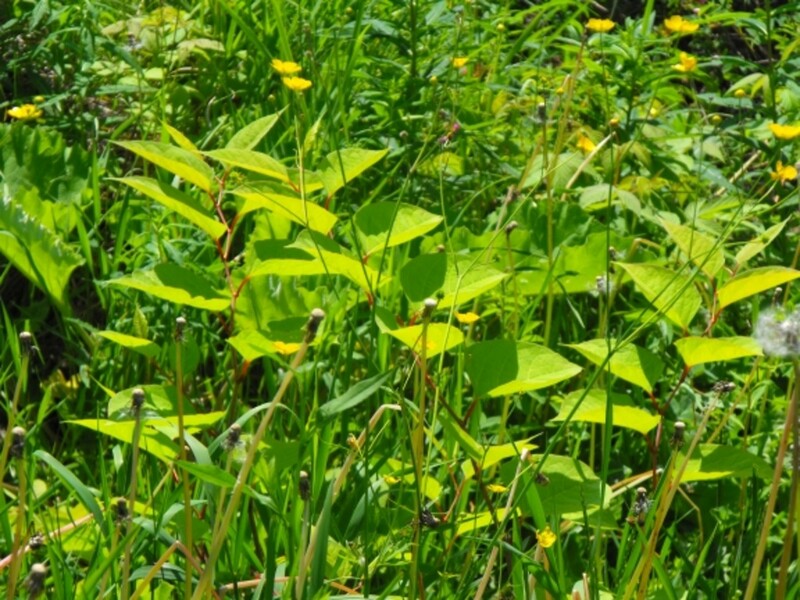 The Invasive Plant That Just Will Not Die! Well, I would like to report the troublesome plant has been eliminated. However, that is not the case. I have reclaimed a large area, but the area is covered by tarps! Underneath, pale tendrils of snakelike stems try to sneak out to the light. Covered roots send out new growth far from the original plant. It is a battle royal. The Japanese Knotweed system is definitely weakened, but given half a chance it would be back in full foliage choking out the competition. The entire area is stripped of foliage to combat this plant. It has not been fun. Oh yes...under the green tarp, there was enough light to grow a weaker set of plants...just check out the picture below...it had no direct rainfall and managed to survive....grrr. By the fall, it finally seems the root system is showing some distress. 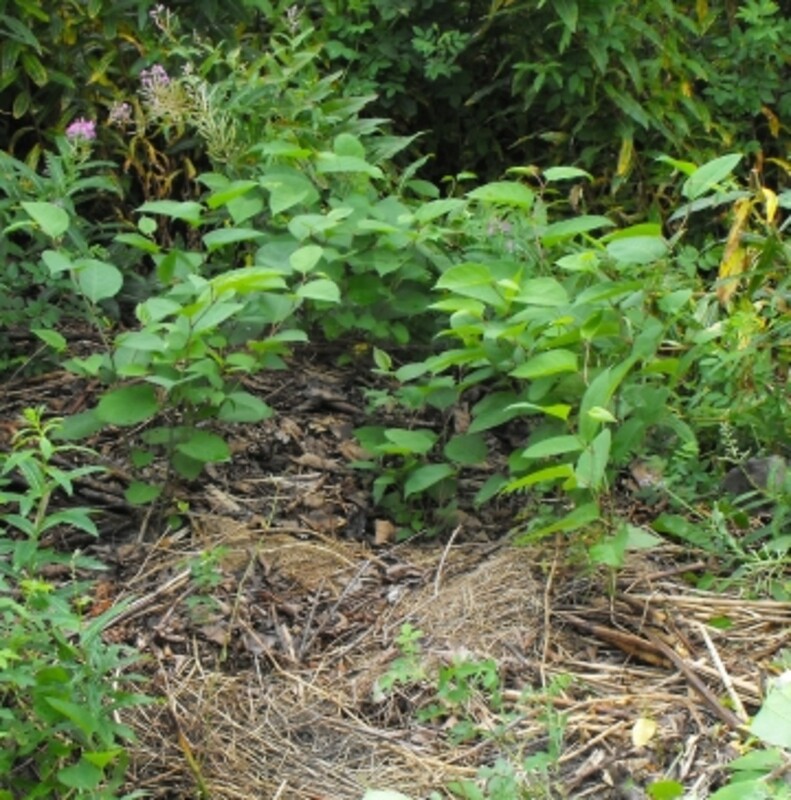 The Japanese Knotweed sent up very weak secondary shoots by late summer. After repeatedly cutting stalks and pulling out clumps of roots whenever possible (usually after a rain when the ground is softer), I finally feel I am on the winning side. Not that I have won. I am practical enough to know the battle is not over. Every single plant and it's root system needs to be eliminated one way or another. 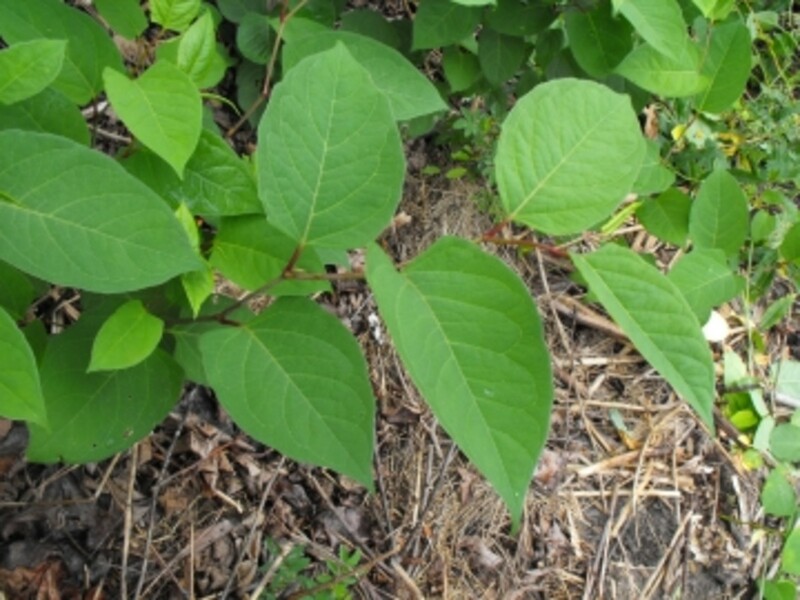 I need to watch to keep the area "clean" of even one viable plant, which means not letting the area get overgrown with any plants so I can watch out for any new shoots of Japanese Knotweed as they pop up (the shoots like to hide in other foliage). Perhaps I have the very dry summer of 2012 to thank for this small victory. This is a battle that has been going on for eight years ( it took a few years to recognize the battle I faced and to realize cutting alone did nothing) and I have despite my very extreme measures described above still not eradicated this very tenacious plant. Next spring I will examine my options. I do not feel comfortable trying to cultivate the area yet, so it will remain an eyesore as I keep the ground covered and clear a larger area around the original patch to keep the invasive plant contained. I feel hopeful that I may 'now" be able to begin claiming this area one square foot at a time in the years to come. 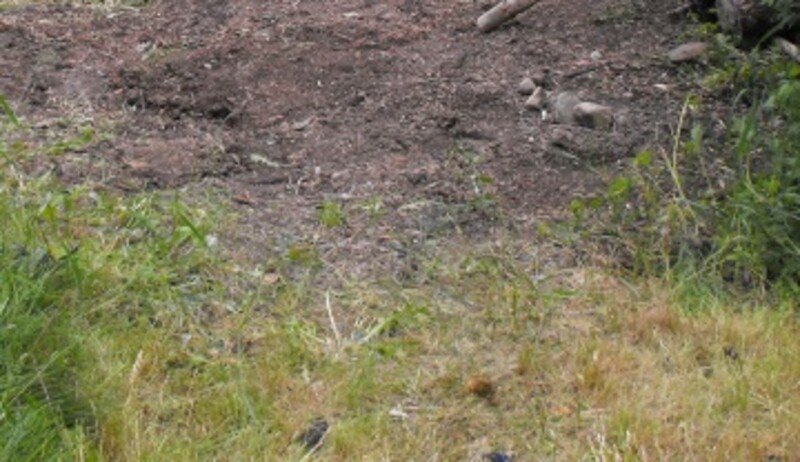 I plan to dig up the perimeter and remove the roots of all weeds and plants in the area. It is definitely a work of love. Thank goodness I love gardening and am willing to do the work because i couldn't afford someone else to do this for me...as well, no one will ever appreciate how thorough I have to be to rid of this pest. Unless someone has battled this plant, there is no way to realize just how difficult a battle that is! 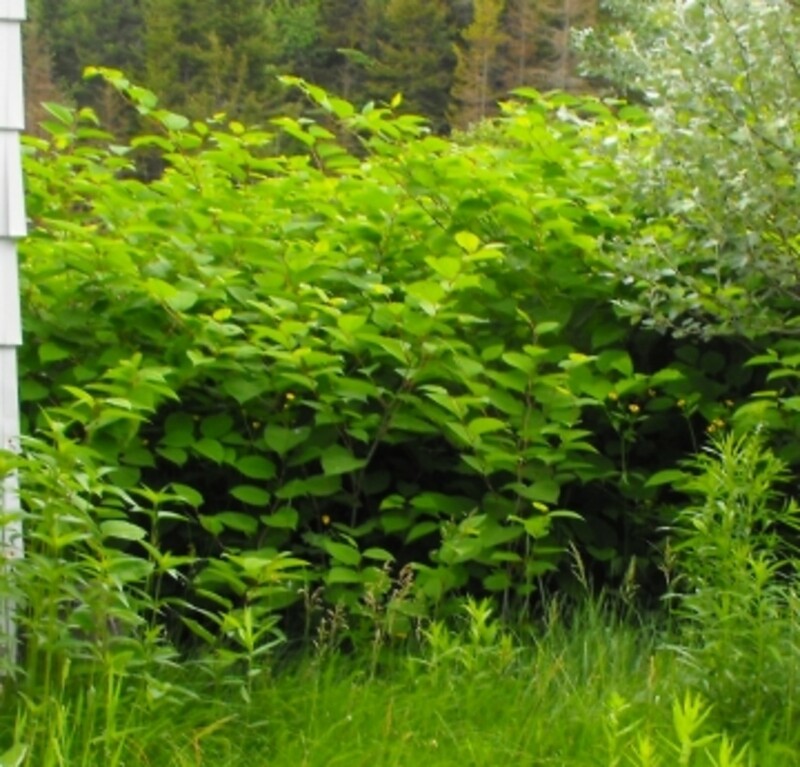 How Many Years to Eradicate Japanese Knotweed? I hate to tell you my battle still continues in 2013. I have dead areas that have been covered for ages and this year I dug up big honking roots under the barren area (see picture) and unfortunately they looked far from dead! They are still sending shoots out to the edges of the tarp as can be seen in the before picture of 2013...the plants are more sparse but just as healthy. Not sure if digging up these big knots of roots help...but at least (perhaps) slow the growth...hopefully! For some reason, I decided not to cover the areas I pulled out the Japanese Knotweed this time. Perhaps I just wanted to see the soil after all these years and let some other plants try to get a foothold ( I planted some flower seeds into the barren ground). This is an extremely invasive plant and very hardy. Another plant would have been long gone and this particular plant has persisted after years of abuse and attempts to eradicate it. I have not given up...just decided to give a chance to some other plants to crowd them out. i will continue to dig and cover once the new crop makes another appearance. On a positive note, there are areas that have been reclaimed by other plants from previous years of covering with tarps...some areas as big as ten square feet. Update: Still had weakened growth in 2014. I am still posting results. The 2015 growing season is yet to begin in my neck of the woods, but I can say 2014 still had fairly decent growth of my adversary, the Japanese Knotweed (JK). I have to dig up my photos having got slightly weary of fighting this persistent plant. Last summer I had cleared a patch of about 4 feet by 4 feet in the center where I planted and grew wildflowers seeds with moderate success. The shoots of JK that came up in there were definitely weak and hurting. My battle has extended to using a pickaxe after rain has softened the soil. I pull out as much root as I can using the pickaxe as a lever to apply extra force then mashing up what I don't have the strength to lift. Still found big hunks of roots in 2014. Last fall I had to dig up some more earth for drainage problems and was glad to find less root systems than I expected. Hope springs eternal that I may yet get this area fixed and have a nice sheltered mini garden with an area for sitting outside my kitchen window. It has been about a decade! Whew. Well, I still have this invasive plant growing beside my house. The good news is that the plant is finally showing weakness. There were fewer shoots and they were a fraction of the height they normally would be. My wildflowers have gained ground and cover 85% of the area that was formerly dominated by the knotweed when I began battling this invasive weed years ago. 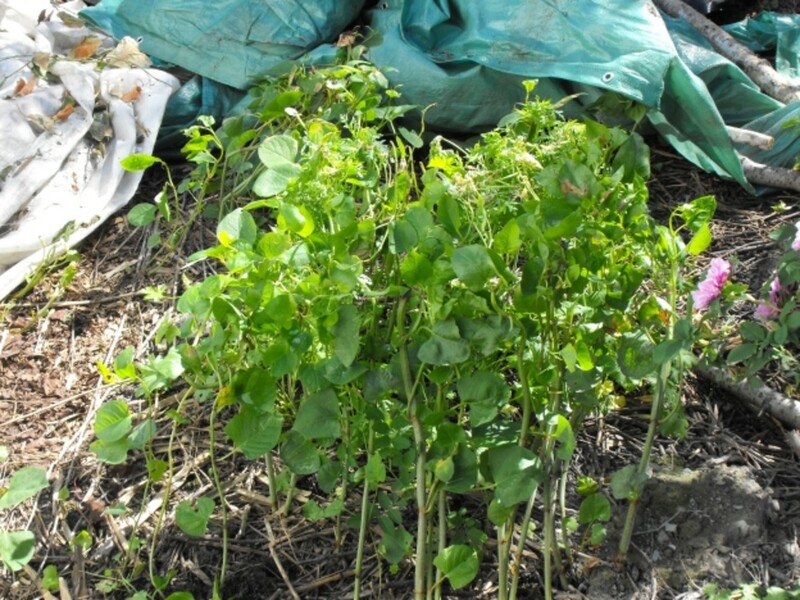 The pile of pulled out knotweed was significantly smaller than any other year. I am cautiously optimistic. I also know that it is by no means over but, perhaps, I have turned the corner, finally so that maybe removing errant shoots will not be such an intensive job. That only took a decade and then some. Well, I now have other plants growing in the area which was completely Japanese Knotweed. I still get weak shoots growing which I pull our mercilessly and leave to dry and die right on the same site. I have a natural thicket of old growth rose bushes that keep this pest confined, but it takes considerable patience examining the area to pull out each and every Knotweed shoot I can find. I am winning the battle, but you can see this was an enormous task requiring patience and care and a ton pf elbow grease. I will not rest until I no longer can find any Knotweed for several years. That may still be years from now. 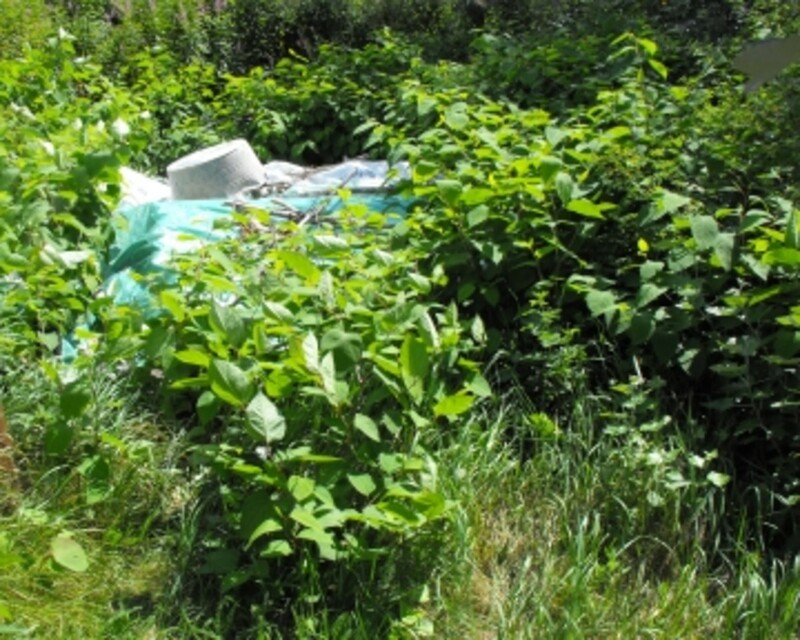 jjdiogenes....Yikes, is all I can say...these Japanese Knotweed are too hardy...you do have your work cut out for you...my patch is putting up quite the resistance to eliminating them and I would say after all these years, the patch is ready to burst out if I would just relax! I just found out I have a big patch of this behind my house - it looks like I have a lot of work to do as they are enveloping my air conditioner unit. Yikes! Hi James! I suppose that is true..This Japanese Knotweed, however, is growing in an area that has never known any cultivated planting...so the soil is not great and not much in the way of plants at all...just some wildflowers and vegetation...but I suppose the conditions are favorable for this plant, perhaps sunny and wind-protected! I seems Most invasive Plants and Animals are more aggressive when introduced to favourable and new environments. Thank you for your comments, much appreciated!! There are a few new shoots of False Bamboo making an appearance peeking out around the edges already and where I haven't yet covered with tarp. I expect to do battle for quite a few years and probably still have to be vigilant! I will keep posting yearly results. I expect next spring's crop should be just as verdant green as this year's...only difference was I cut down this year's plants before they had a chance to flower, but according to what I have researched, it is the root system that is the problem....not going to try to dig that up! 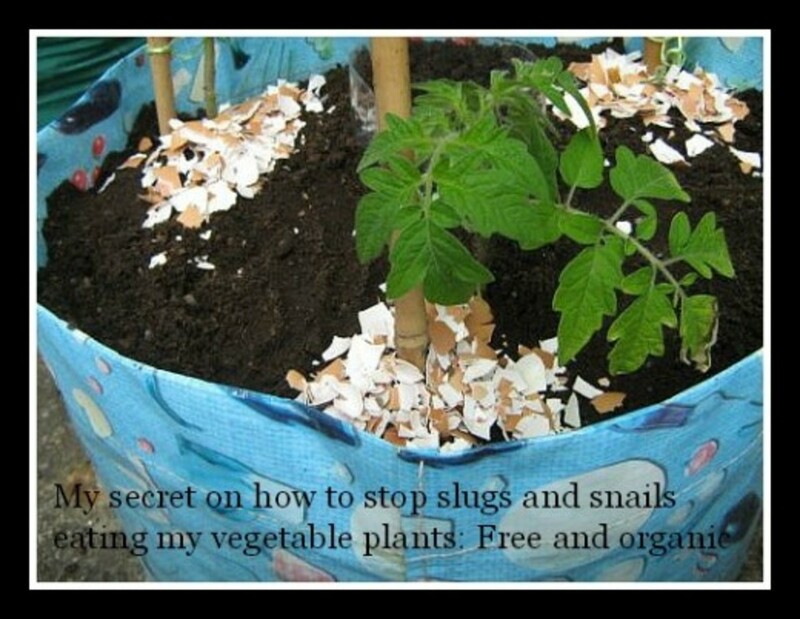 I will try the cut and rot method first!